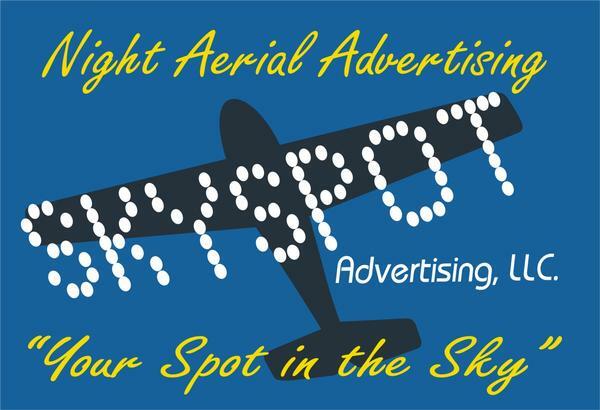 Skyspot Advertising, LLC. is a night aerial advertising business operating in the greater Tampa, Lakeland, and Orlando areas. Using similar technology as the Good Year Blimp, we scroll messages with an electronic sign from a Cessna 172 aircraft. Messages can be seen over high-density traffic highways, sporting events, festivals, holiday events, and many other venues with a large area of reach. Fall and Winter are the peak seasons for business in Florida, and the events are just around the corner. Skyspot advertises at the 4th of July, Football, Guavaween, Florida Pirate's Festival, Illuminated Boat Parades, Fireworks, Outback Capital 1 Champs Sports Bowls (Outback Capital 1 Champs), Gasparilla, Florida State Fair, Strawberry Festival, Sant' Yago Knight Parade, Sun n Fun, Central FL fair, rush hour traffic, holidays and much much more. We offer 35% commission on new business sales and 20% commission for established business sales within our local market. Special Events outside of our local market earn 25% -30%commission. Each event night has the potential to earn $400-$3500 commission. Skyspot Advertising, LLC is looking to hire a part-time to full-time advertising sales agent. We expect polished, professionals that understand business and sales. We also look for expert-level of communications skills, impeccable integrity, and service ethic. With this job you can enjoy working from your own home, no commuting, and set your own hours. A simple process to success!